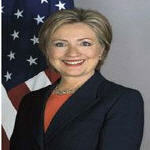 Secretary of State Hillary Rodham Clinton will begin a seven-nation trip to Africa on August 5 at the 8th U.S. – Sub-Saharan Africa Trade and Economic Cooperation Forum (known as the AGOA Forum) in Nairobi, Kenya. This trip will highlight the Obama administration’s commitment to making Africa a priority in U.S. foreign policy. This will be the earliest in any U.S. administration that both the President and the Secretary of State have visited Africa. While in Kenya, Secretary Clinton will discuss new approaches to development, including an emphasis on investment and broad-based economic growth. The Secretary will be joined in Kenya by Secretary of Agriculture Tom Vilsack, U.S. Trade Representative Ron Kirk, and Assistant Secretary for African Affairs Johnnie Carson. During the visit to Kenya, the Secretary will deliver a speech at the Ministerial Opening Ceremony for the AGOA Forum, participate in bilateral meetings with Kenya’s senior leaders, discuss global hunger and agricultural issues at a major research institute, and engage with Kenyan citizens. She will also meet with Sheikh Sharif Amed, the President of Somalia’s Transitional Federal Government. The Secretary will continue her travel with stops in South Africa, Angola, the Democratic Republic of the Congo, Nigeria, Liberia, and Cape Verde. In each nation, she will emphasize Africa as a place of opportunity, built on an ethic of responsibility. She will underline America’s commitment to partner with governments, the private sector, non-governmental organizations, and private citizens to build societies where each individual can realize their potential. In her bilateral meetings and other events, she will encourage new solutions to old challenges, harnessing the power of innovation and technology to provide a foundation for future stability, human development, and sustainable economic growth. She will stress the importance of facilitating social and economic entrepreneurship, encouraging a new generation of young African scientists, small business leaders, entrepreneurs and civic leaders who are solving real problems and establishing new models for economic success and social advances, with women as full partners in this progress. And she will discuss ways to foster good regional governance, partnering with regional leaders to band together to prevent conflict and violence, including gender-based violence, democratic erosions, and transnational threats. Following her visit to Cape Verde, the Secretary will return to Washington, DC.